Increasing demand for energy from residential, commercial and industrial applications, there is growing advancement in the electric transmission and distribution (T&D) technology. High demand, high level of safety, flexibility throughout the life cycle, and low costs must be taken into consideration in order to efficiently supply the electricity. Growing number of installation of the electric system at commercial and residential places such as air conditioners, ventilators, lighting system and fire protection system is majorly impacting the electric T&D. Modernization in the electric grid and the technological advancement of T&D equipment are the major driving factors in the growth of the market. In total, the 3 factors i.e. electrification of large sectors of the economy, decentralization of the system to make the customer as involved and digitization of the grids and meters, combinedly supports the growth of electric T&D equipment market. Further, electric meter plays a crucial role in the T&D of power in order to analyze the total power transmitted and consumed across the various application. The trend of transforming the transportation economy towards using electric vehicles fuels the opportunity for the development and advancement of T&D equipment. Goldstein Research analyst forecast that the global electric transmission and distribution equipment market is set to reach nearly USD 312 billion by 2024, growing at a CAGR of 6.41% over the forecast period (2017-2025). Wire and cable segment accounted for the largest market share of 29.4% in 2017 as they have the primary role in the transmission and distribution of power. Over the forecast period meters segment is expected grow at a CAGR of 8.7% to acquire over the larger market share on account of rising smart grids. Based on geography, North America accounted for the largest market share as the U.S. alone total T&D equipment exports accounted for USD 2.0 billion. Further, Mexico tops the T&D equipment sub-sector rankings, as it benefits from the established power distribution channels, same grid frequency operation, closer proximity to the United States and high demand for electricity. Thus, Latin market, Asia-Pacific and African market are more likely to grow after the US, due to the fact of high population and development towards better performing T&D equipment. The report covers the present ground scenario and the future growth prospects of the electric transmission and distribution equipment market for 2017-2025 along with the market players’ analysis. We calculated the market size and revenue share on the basis of revenue generated from major players in the Global region. Global Electric Transmission and Distribution Equipment Market Outlook 2017-2025, has been prepared based on an in-depth market analysis from industry experts. The report covers the competitive landscape and current position of major players in the Global electric transmission and distribution equipment market space. The report also includes Porter's five force model, SWOT analysis, company profiling, business strategies of market players and their business models. “Global Electric Transmission and Distribution Equipment Market Report” also recognizes value chain analysis to understand the cost differentiation, pricing models to provide a competitive advantage to the existing and new entry players. 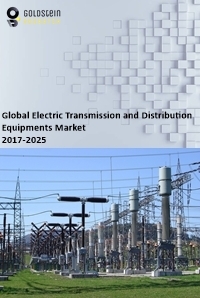 Our Global electric transmission and distribution equipment market report comprises of the following companies as the key players: ABB, GE-Alstom, Prysmian, Schneider Electric, Siemens, Burns and McDonnell, 3m, Power Engineering International, Sterlite Power, etc.